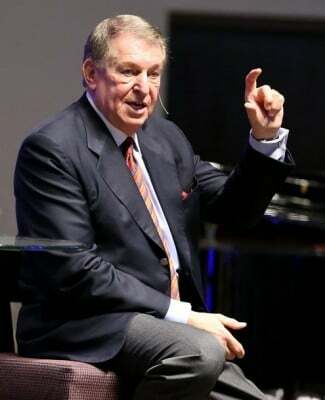 Jerry Colangelo has long been a nationally renowned leader in sports, the most influential business and community icon in the Valley and a valued adviser for Grand Canyon University. Now his integrity and expertise will command an even larger presence at GCU. Three years after the Colangelo School of Sports Business was created, University officials announced at a press conference this morning that Colangelo’s name will be on the entire College of Business. The new name: Colangelo College of Business (CCOB). Colangelo has been among the most influential people in the Valley since 1968, when he became general manager of the Phoenix Suns at age 28. He was the youngest general manager in professional sports. He bought the Suns in 1987 and turned a struggling franchise into the team that went to the NBA Finals in 1993, and in 1998 he brought professional baseball to Phoenix when the Arizona Diamondbacks were born. In only their fourth season, the D-backs won the World Series, denying the New York Yankees their fourth consecutive championship. He also was instrumental in the creation of three other local franchises — the Mercury (pro women’s basketball), Rattlers (arena football) and Sandsharks (indoor soccer) — and helped bring hockey to the Valley when the Coyotes were moved here from Winnipeg. Colangelo was elected to the Naismith Memorial Basketball Hall of Fame in 2004 and was named the first managing director of the USA Basketball Men’s Senior National Team a year later. Under his leadership, the U.S. has four straight international gold medals, including golds at the last two Olympics. His get-things-done approach also has been evident in the rapid growth of GCU’s sports business school, which has gone from 194 on-campus students in 2011 to 286 in 2012, 320 in 2013 and 400 this school year. Similarly, the number of online students has jumped from 221 in 2011 to 330 and then 493. This year’s online total was not available. Colangelo is a frequent visitor to classes and events at GCU, and Dr. Brian Smith, director of the School of Sports Business, said he talks with Colangelo regularly — an average of about once a week but some weeks as many as four or five times — and greatly values the “30,000-foot view” Colangelo provides with his ability to see the landscape of an issue today and five or even 10 years down the road. The sports business school will continue to have Colangelo’s name on it, only now he’ll get an opportunity to put his stamp on the entire college. Colangelo’s influence at GCU has been evident in other ways, including the hiring of one of his former Suns players, Dan Majerle, as head coach of the men’s basketball team. Colangelo has been on the University’s board of directors and has been an adviser in its transition to Division I athletics. In conjunction with today’s announcement, GCU is creating a new scholarship program for high school seniors who best exemplify the characteristics Colangelo exhibits — a commitment to academic excellence, impeccable character and integrity, and a strong sense of community — but whose college options might be limited for financial or family reasons.